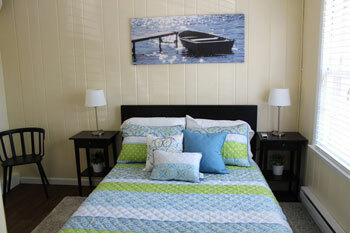 You have many lodging choices when you visit beautiful Ludington, Michigan. You want a nice clean room, friendly service, and close access to all that Ludington has to offer. 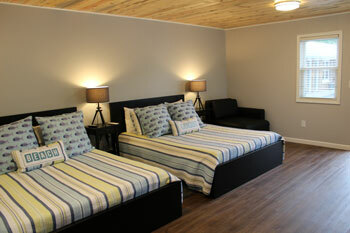 The newly renovated Avenue Motel may be what you're looking for. Unlike the larger hotels and motels, Avenue Motel has just eight rooms, so you'll get personal attention and exceptional service. Avenue Motel was bought by Chris and Lori Eldredge, and their goal was to remodel and update the rooms to make them more comfortable for their guests. They purchased all new furniture and added new flat screen TVs. The bathrooms are beautiful, with all new showers, toilets and vanities. All rooms are bright and cheerful, with AC and Wi-Fi. 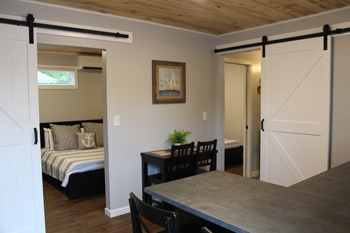 There are two mini-suites available with a refrigerator and microwave. For your convenience, Avenue Motel offers complimentary Voss water in every room. There's also complimentary coffee and danish pastries for guests every morning. Coming in by air or by the carferry? Avenue Motel will gladly pick you up at the airport or carferry dock and get you back when you check out. 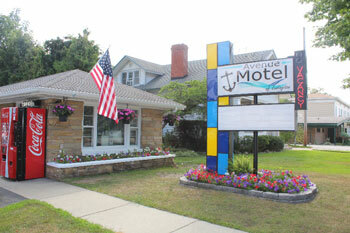 Avenue Motel is three blocks from downtown Ludington, with Stearns Park Beach just minutes away. During the summer, the downtown region is a hub of activity, with events like Friday Night Live, Ludrock, Farmer's Market, and various Art Fairs. In the off-season you can attend Suds on the Shore, Octoberfest, New Year's Eve Lighted Ball Drop, and Brrrewfest. But any time of year, downtown Ludington has numerous shops to browse and many restaurants to satisfy any appetite. Contact the Eldredge family at (231) 425-3889 to make your reservation at the Avenue Motel in Ludington. The friendly service and cozy rooms will make you come back time after time.